Renesas Electronics Corporation, a premier supplier of advanced semiconductor solutions, today announced the expansion of its RX24T and RX24U Groups of 32-bit microcontrollers (MCUs) to include new high-temperature-tolerant models for motor-control applications that require an expanded operating temperature range. The new RX24T G Version and RX24U G Version support operating temperatures ranging from −40°C to +105°C, while maintaining the high speed, high functionality, and energy efficiency of the RX24T and RX24U MCUs. 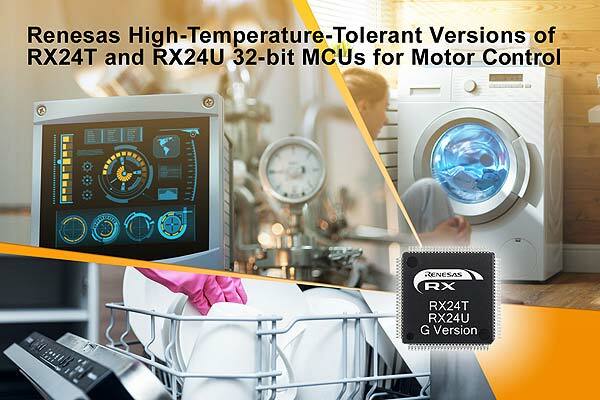 For more information on the new RX24T G Version, visit: https://www.renesas.com/products/microcontrollers-microprocessors/rx/rx200/rx24t.html. For more information on the new RX24U G Version, visit: https://www.renesas.com/products/microcontrollers-microprocessors/rx/rx200/rx24u.html.